After targeting the Islamic State (ISIS) group in the wake of Deadly terror attacks in Paris, hacktivist group Anonymous has now turned its attention to controversial US presidential candidate Donald Trump. The hacktivist group has declared war against Donald Trump following his recent radical speech stating he wanted to ban Muslims from entering the United States. "Donald Trump, it has come to our attention that you wish to ban all muslims from entering the United States. Muslims and Islam are not the problem. This policy will have grave impact and will serve only to fuel the emotions that ISIS uses to recruit muslims. Certainly ISIS will use this to their advantage in their social media campaigns. Instead of focusing on the innocent, the focus should be set on ways to protect them from the radicalized individuals they flee. Donald Trump, think twice before you speak. This policy is one that cannot be accepted. Denying people of opportunity to escape hardship is not a solution of a future world leader. If anything, this solution will only bear more conflict. We cannot sit idle with the possibilty of detrimental consequences. Should this policy be pursued any further, we will have no choice but to take action." Moreover, the group started #OpTrump hacking campaign against Donald Trump on Wednesday night and took down the website for New York City's Trump Towers (www.trumptowerny.com) by hitting it with Distributed Denial-of-Service (DDoS) attacks. The website was reportedly down for hours. However, it appears to be operational now. 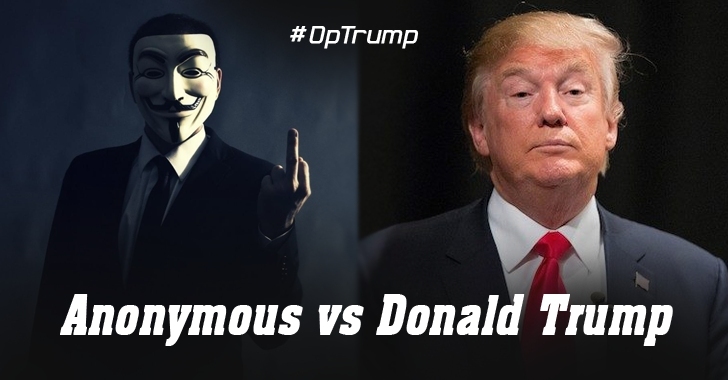 While the online hacktivist group has yet to officially claim responsibility for the DDOS attack on Trump's website, Twitter users showed their full support to Anonymous and its #OpTrump campaign. This is not the first time the group has targeted Trump. Few months ago, Anonymous broke into Trump.com in an effort to deliver Jon Stewart a message as he was about to leave The Daily Show. As we await Anonymous's next move, the group has already declared Friday to be a day to troll ISIS, urging Twitter users to troll ISIS using the #Daeshbags hashtag. Meanwhile, a website known as FriendsWhoLikeTrump.com has been created to show you which of your Facebook friends have "Liked" Donald J. Trump. Clicking on the site will land you to a Facebook search feature that shows what your friends have liked, or you can achieve the same yourself by simply typing "My friends who like Donald J. Trump" in the Facebook search bar. You will get a list of anyone in your Facebook network who has clicked "Like" on Trump's Facebook page.